This little dual-speaker amp sure packs a lot of sound into a small package - check out the demo video below for proof! 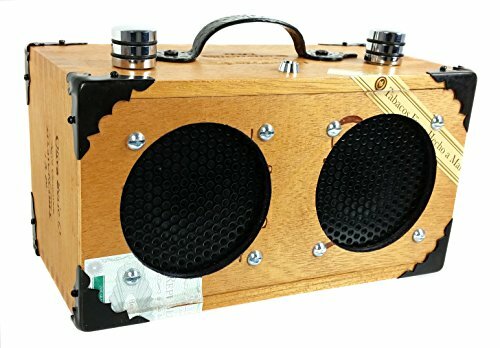 If you've been looking for a nice loud little cigar box amplifier to go with your Cigar Box Guitar or store-bought guitar, then look no further! These great little amps are hand-crafted in the U.S.A.. in C. B. Gitty's workshop. Their heart is an Artec SDA-T 2.5W amp board, which is powered by a 9V battery. The amp accepts a standard 1/4" mono guitar chord as input, and output is through dual 3.5" 1W speakers. A red LED power indicator is included to help prevent accidental battery drain. These little amps put out a very respectable sound, and in our opinion are much superior to the smaller half-watt and one-watt amps! The dimensions of this amp are: 8" wide x 4 1/4" high x 4" deep. The box is an all-wood Oliva Serie G.
Nice loud sound - Great for busking, cigar box guitars and more!